The purpose of this letter is to inform our valued customers of improvements we have made to our Challenger luminaires. The adoption of LED light sources has gained momentum in recent years, primarily due to their operational efficiencies and enhanced reliability. In response to this we must adapt with the times and augment and improve our products to meet demand. To this end we have updated and improved the Challenger enclosures. As before, fluorescent versions are typically supplied with prismatic effect lenses and LED versions with an especially developed cloud lenses. The new cloud lens is more translucent than the previous opal lens; as such it is better equipped to manage the light output of our LED printed circuit boards. It distributes light with perfect uniformity, without spotting, whilst also allowing for operating efficiency savings in excess of 40%. Our new enclosure is dust tight and water jet proof, with an ingress protection rating of IP66. Hence, the new improved Challenger is referred to as the “Challenger 66”. Additionally, this Challenger has further specification improvements. It now has robust stainless steel lens clips as standard and a shock resistance rating of IK10, being able to withstand impacts of 20 Joules without compromising the enclosures integrity. 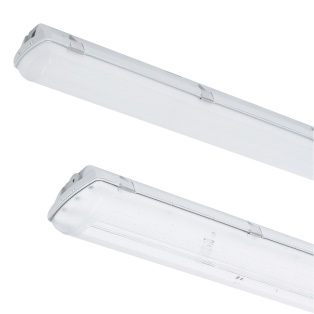 It is important to stress that despite all of these upgrades and improvements the new Challenger 66 luminaires, both fluorescent and LED, house the same electrical components as their predecessors and we will continue to carry these components as spares. The only way the Challenger 66 luminaires differ is their enclosures, though these remain aesthetically very similar to previous versions. Naturally, all versions are still available with our intelligent MIC & RIC lighting control system, and what’s more, we shall not be increasing prices for these improvements. These alterations to the Challenger range are in line with our policy to continuously improve our products and offer our customers the latest and most current value propositions.